Mahan Abedin interviewing Dr. Mohammed Jaber. Mohammad Jaber was born in Nabatieh (Southern Lebanon) in the late 1950s. Upon completion of his higher education, he travelled to West Germany to study medicine before returning to Lebanon in 1985. Today he runs a clinic in Nabatieh. Jaber joined Hizbut Tahrir (HT) in 1974. He acceded to the position of the head of the executive committee of HT in Lebanon in 2006. The committee is comprised of five people who are elected every two years. Mahan Abedin – How would you characterise the strength of Hizbut Tahrir (HT) in Lebanon? Mohammed Jaber – HT does not attach importance to membership in quantitative terms but to the quality of its members and their mastery over ideological, intellectual and juridical concepts. HT is striving to change Lebanese society according to Islamic standards and norms. The creation of the Islamic state will only come about after intensive preparatory work at the social, cultural and political levels. The people have to be educated about the ethics, values and objectives of the Islamic state before this state can be realised. We don’t envisage that Lebanon, of and by itself, will become the Islamic state in the near future. Rather we consider Lebanon as one integrated part in the wider whole of the Muslim Ummah, and hence Lebanon will join the wider Khilafah (Caliphate) state once it has been established. Mahan Abedin – What are the core activities of HT in Lebanon? Mohammed Jaber – As a non-establishment political party HT encourages people to return to Islamic ideals. The situation in Lebanon requires radical changes but this requires time. HT in Lebanon strives to create and maintain contact with influential people in Lebanon with a view to bringing about the desired changes. We also stress the need to engage with the public and the political class, at the intellectual and political levels to build momentum around our platform. We believe that intensive disucssion is needed to trigger deeper changes both at the individual and collective levels. Mahan Abedin – In light of HT’s origins in Palestine, does HT Lebanon coordinate closely with HT branches in other Levant countries, in particular in Palestine, Jordan and Syria? Mohammed Jaber – HT is a global political party and we have the same ideology no matter where we are based in the world. We have knowledge about HT activities in other countries, but we don’t necessarily coordinate our activities. At the same time both intellectually and ideologically we consider the Muslim Ummah as one; as such a Muslim shares the concerns and aspirations of the Ummah across the globe. Mahan Abedin – It has been suggested that HT is strongest in its historical core, namely the Levant. Is this true? Mohammed Jaber – HT is strong in many areas, including for example Central Asia and Turkey. To give you an example from Islamic history, the Islamic message first emerged in Mecca but the first Islamic state was created in Medina. Therefore, just because HT first emerged in this region that doesn’t mean its ideas will fully blossom in this region first. Mahan Abedin – Is it true that you are a Shi’a Muslim? Mohammed Jaber – First and foremost HT doesn’t attach significance to sectarian identities and differentiation within Islam. Our objective is to promote a common Islamic identity on the global stage. But in answer to your question I was born into a Shi’a Muslim family in Nabatiyeh in southern Lebanon. I was attracted to HT for many reasons, one of them being HT’s non-sectarian attitudes. According to HT beliefs, religious differences in Islam – for instance the number of times Muslims pray daily and minor differences in how they pray – are of no significance whatsoever. What is important is to adopt, maintain and strengthen a common Islamic identity with a view to political mobilization on a global scale. Furthermore, we adopt a vision and plan to eventually eliminate these schisms and sectarian divisions among the Muslims; in our view a person is either a Muslim or a Kafir (non-believer); if he’s a Muslim he’s supposed to work with his fellow Muslims to serve the Deen (Faith), otherwise we call upon the non-Muslims to enter in the faith and join the global community of Muslims. Mahan Abedin – But according to some scholars, adopting HT’s ideology is tantamount to relinquishing core Shi’a beliefs! Mohammed Jaber – I don’t agree with this statement. And you will find that many leading Shi’a clerics, including Grand Ayatollah Mohammad Hussein Fadlallah of Lebanon, would not agree with this statement. Mahan Abedin – HT claims to be non-sectarian, but do you sincerely believe that all HT chapters around the world follow this policy? Mohammed Jaber – There is an HT ideological-political training book called the “Fundamentals of Islam” – issued in 1953 – which clearly states that adherents of the Jaafari school of Islam (i.e. Twelver Shi’as) are fully-fledged believers who have the right to play an active role in the Islamic state, including acceding to the highest political-religious office, namely that of the Khalifah (i.e. Caliph). I can sincerely and categorically claim that there is no sectarianism in HT at all. Anyone who adopts sectarian beliefs or attitudes has stepped out of the HT ideological framework. Mahan Abedin – The ultimate objective of HT is the creation of a Caliphate but throughout Islamic history Shi’a Muslims – on account of their minority status – have had at best a lukewarm attitude toward this institution. Do you think it is possible to surpass the weight of history and ameliorate deeply-rooted fears? Mohammed Jaber – This is an important question. You are correct to state that generally speaking Shi’a Muslims are not convinced about the virtues of the Khilafah. The best way to overcome this misunderstanding is through education and the involvement of Shi’a Muslims at every level of the wide-scale effort to bring about the Islamic state. Let’s not forget that Imam Ali (AS) was also a Khalifah. Mahan Abedin – If you look at the development of modern Islamic political thought and wider intellectual trends in the past 200 years one of the most striking features is the absence of the Khilafah concept from Shi’a political thought. This idea is exclusive to Sunni Muslims. How can you bridge such a vast intellectual and political chasm? Mohammed Jaber – It is not correct to say that Shi’a scholars reject the Khilafah. For instance, both Grand Ayatollahs Mohammed Hussein Fadlallah and Mohammed Baqer Al-Sadr  expressed support for the creation of the Khilafah. Furthermore we believe that all Muslims must refer to the prophet Mohammad (SAW) in providing the true Islamic concept of the Islamic state; we aim to build a consensus on this central issue. Our success across the Ummah proves that this is both possible and necessary. Mahan Abedin – In my discussions with HT leaders and members across the world I have noted that they provide different, and at times conflicting, evaluations of Hezbollah. What is the official HT attitude toward Hezbollah? Mohammed Jaber – HT regards Hezbollah as a sincere religious Islamic political group and resistance organisation. It is a religious duty to support Hezbollah’s resistance against the Zionist regime and its drive to liberate occupied Palestine. But HT is critical of Hezbollah’s close ties to Syria and Iran, since we believe that these countries are somehow complicit in American policies in the region. We are particularly critical of Hezbollah’s relations with Syria since we suspect that the Syrians’ tough rhetoric on Israel is a smokescreen for their secret desire to reach accommodation with the Zionist entity. We constantly talk to Hezbollah about these issues and we do our best to advise them. Moreover, we strongly criticised Hezbollah’s deep involvement in Lebanese domestic politics, which has seriously undermined the original Islamic platform of the resistance organization. Sadly they failed to advance a pan-Islamic political programme and instead became a mere participant in the political order imposed by the colonial Sykes-Picot Agreement . Here, indeed, lies our basic central difference with Hezbollah . 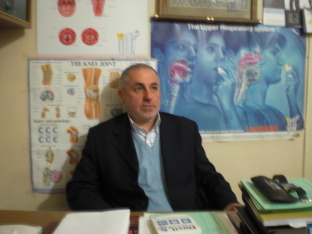 Dr. Mohammed Jaber, head of the executive committee of Hizbut Tahrir in Lebanon. Mahan Abedin – I have heard that you met the late Ayatollah Ruhollah Khomeini in Paris back in late 1978, a few months before the victory of the Islamic revolution. What was your assessment of the late Ayatollah Khomeini and what is your assessment of the Islamic revolution in Iran? Mohammed Jaber – When I met Imam Khomeini back in 1978, the HT delegation delivered a letter to the Imam and we asked His Eminence if his movement had a project to create a global Islamic state and we also asked him if they had prepared a constitution. We impressed upon the Imam the importance of devising a proper constitution for the Islamic state. We told him in no uncertain terms that HT was prepared to assist the Iranians in building the Islamic state, even if this state was dominated by Twelver Shi’as. But we had one condition, namely that this state must belong to all the Muslims. It shouldn’t be an Iranian national state. Mahan Abedin – What was the exact date of this meeting, how many people were in the HT delegation and who were they? Mohammed Jaber – We met the Imam on three occasions. The first meeting happened in October 1978; the second in December 1978; and the third in early February 1979, just before the Imam’s return to Iran. The delegation consisted of three people; myself, the head of HT in Europe at the time and his assistant. Mahan Abedin – What was Ayatollah Khomeini’s response to your overtures? Mohammed Jaber – Imam Khomeini listened much more than he talked. And when he talked he did so in general terms. The Imam was reluctant to get bogged down in details. Mahan Abedin – Based on the experience of the first decade of the Islamic revolution (1979-1989), in your view was Imam Khomeini a true champion of the politics of pan-Islam? Mohammed Jaber – Doubtless Imam Khomeini was a great and sincere Islamic leader. He had a global impact in the political and juridical fields. The Imam also changed the course and some underlying concepts of international relations, particularly in our region. However, the state that he led can not be described as Islamic in the strictest definition of this term. It may have been a state for specific type of Muslims, but it wasn’t a state for Muslims as a global community. Mahan Abedin – In the light of recent political events in Iran, what is your assessment of the survivability (or otherwise) of the Islamic Republic of Iran? Mohammed Jaber – I am going to give you my personal opinion, but this opinion is shared by most HT leaders and members across the world. The Iranian regime is strong precisely because its legitimacy is based on Islam. It is an imperfect Islamic state, but nonetheless it aspires to reach the stage where it can qualify as a truly Islamic state. In any case, that is how the Islamic Republic projects itself to the outside world. Yet we maintain that the leaders of the revolution have failed to advance a truly pan-Islamic vision encompassing the entire Muslim Ummah; instead they drifted toward a nationalistic Iranian agenda, even if it meant collusion with American plans in Iraq, Afghanistan, Yemen and Lebanon. Nevertheless, the West wants regime change in Iran – and failing that to at least alter the nature of the regime – but I don’t think the Iranian people want a Western-friendly government. Mahan Abedin – Is HT losing ground in Central Asia? 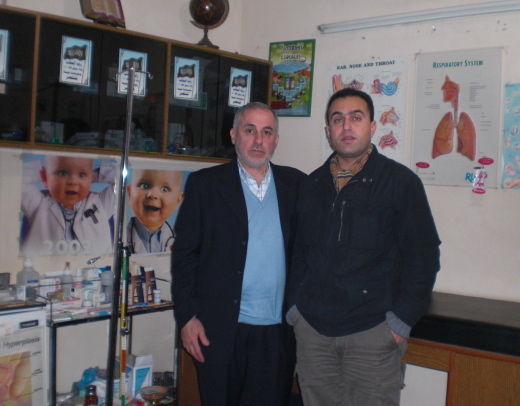 Dr. Mohammed Jaber with Mahan Abedin. Mohammed Jaber – HT is strong across Central Asia despite the harsh crackdowns of local regimes, particularly the vicious regime in Uzbekistan. We are strong because our only weapon is our thoughts and our ideology. Mahan Abedin – Which areas of the world are likely to witness growth in HT activity in the coming years? Mohammed Jaber – Going back to early Islamic history, the Prophet Mohammed (SAW) could not have predicted that victory would be attained in Medina. We can’t predict the future and as such I can’t answer your question. Mahan Abedin – There is a huge debate in Western European countries over the extent and speed of Muslim integration. Are you concerned that HT’s uncompromising stance against Muslim integration in Western Europe may adversely affect the image and welfare of local Muslim communities? Mohammed Jaber – HT’s exclusive weapons are words and ideas. Western countries present themselves as democratic and as such they should practice what they preach. HT has a right to propagate its ideas in these environments. The West has long eschewed the notion of freedoms of speech and religion, why then, if I may ask, would the Muslims be threatened with adverse consequences should they choose to maintain free independendent thinking and viewpoints? Is it not a great irony for the Western society to permit women to go around naked in the name of civility, yet abhor any notion of chastity by objecting to the Muslim women’s Hijab? How is it conceivable that the Hijab threatens a centuries old civilisation? I guess this is indicative of the shallowness of such civilisation. Mahan Abedin – But you are ignoring the historical and cultural dimensions. We are talking about countries that have long histories and a set of deeply embedded secular cultural and intellectual beliefs, practices and traditions. Is HT’s attitudes and intervention in this debate helpful? Mohammed Jaber – The strength of the Muslims is in their ideas and beliefs. If Muslims relinquish their beliefs they would be divesting from their most precious resource. As for HT all our activities in Western Europe is legal and fully consonant with local norms. One of our main objectives in the West is to protect the rights of Muslims as minorities. We will not accept any compromise. We should ask key stakeholders in Western European countries why it is that when it comes to Muslims they are reluctant to exercise the full extent of their ostensibly democratic beliefs. Why are they so intolerant? 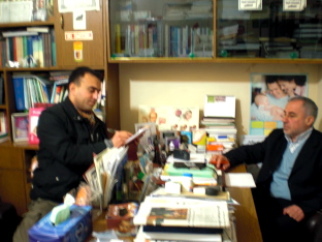 This interview was conducted in Nabatieh on the 6th of February 2010. Grand Ayatollah Mohammed Baqir Al-Sadr (1935-1980) was a leading Iraqi Shi’a scholar, philosopher and ideologue. He is widely believed to have been the spiritual leader of the Iraqi Daawah Party, one of the first Shi’a Islamist groups to emerge on the scene. Following the victory of the Islamic revolution in neighbouring Iran, the former Iraqi regime of Saddam Hussein exerted ever greater pressure on Sadr, culminating in his execution (alongside his sister Bint Al-Huda) in April 1980. This was the first execution of a leading Shi’a cleric by a modern state and as such it sent shockwaves throughout the Shi’a world. Sadr’s political and philosophical trend was taken up by his cousin Ayatollah Sadiq Al-Sadr, who was in turn murdered by Saddam’s agents in February 1999. Today the so-called Sadr movement – which contrary to the original concepts favoured by Baqir Al-Sadr is a populist mass movement – is led by the young firebrand Muqtada Al-Sadr, who is the son of Sadiq Al-Sadr and a son-in-law of Baqir Al-Sadr. Baqir Al-Sadr penned many scholarly works, the most famous and influential of which are Iqtisaduna (Our Economics) and Falsafatuna (Our Philosophy). The Sykes-Picot Agreement of May 1916 was a secret arrangement between the governments of the UK, France (and to a lesser extent Russia) to divide Western Asia into ‘spheres of influence’ following the impending downfall of the Ottoman Empire.